Get assistance with public benefits at our BenePhilly vehicle! This summer the BenePhilly vehicle will visit a different community school every two weeks. The vehicle is a fully equipped, wi-fi enabled office with staff that can check to see if you are eligible for benefits and assist you with an application on the spot. The vehicle is open from 10-2pm. 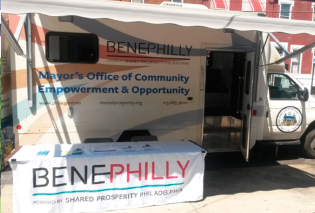 For more information about the Benefits Access Unit or the BenePhilly Vehicle, email benephilly@phila.gov. Also, you can always call (844) 848-4376 or visit a BenePhilly Center to get free, one-on-one professional support to enroll in more than 20 public benefits and services.